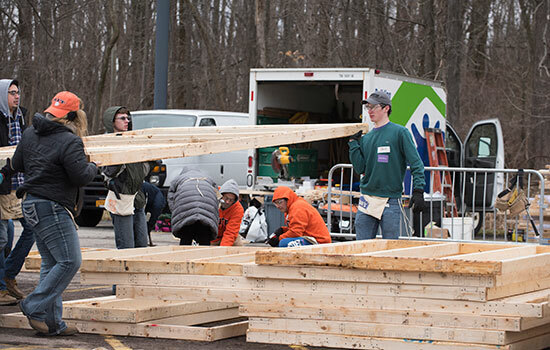 Some 200 RIT students built frames for two Habitat for Humanity homes on Tuesday as part of Service Week. It was the first time Habitat for Humanity construction was done on campus. 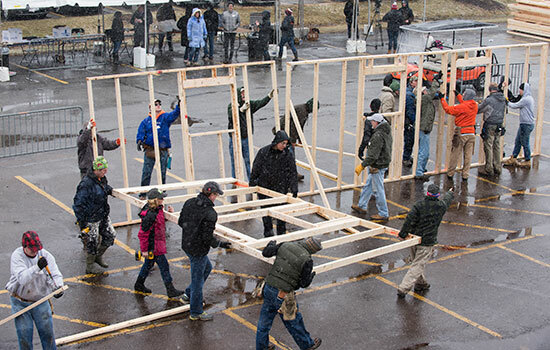 Despite temperatures in the 30s, brisk wind and snow, some 200 Rochester Institute of Technology students as well as some faculty and staff members got a warm feeling by helping others as they joined Flower City Habitat for Humanity to construct walls and frames for two homes to be erected in northwest Rochester. The project is part of Service Week, with dozens of opportunities for students to volunteer in community services. It was organized by RIT’s Center for Leadership and Civic Engagement. At 9 a.m., dozens of students in the first shift began hammering away, with volunteer supervisors who told them how to line up, hold and nail together the stacked lumber. Once completed, the teams walked their frames to a pile, where it would await the next stage for assembly. Jenn Palmer, president of the RIT Habitat for Humanity club, said many of the 200 active students in the club spend each weekend building, installing dry wall, putting on siding and other projects for Habitat for Humanity homes on sites usually in Genesee County. The mission was completed by 3:30 p.m., when the frames were stacked and readied for transport to the vacant lots where the homes will be finished, at 19 Eddy St. and 91 Silver St. RIT students will be invited to help finish the homes on site before the residents move in by the end of the summer. The Flower City chapter of Habitat for Humanity has built or remodeled 240 homes since 1984. The new homeowners, who are people who have a need for improved housing, purchase the homes after qualifying for a mortgage and agreeing to partner with Habitat for Humanity in future projects. “These are exciting days,” said Flower City Habitat for Humanity CEO Matt Flanigan, who said RIT’s efforts will save them three weeks of construction time. It was the first time Clarissa Xue, a third-year human-centered computing major from San Diego, volunteered with Habitat for Humanity. She hammered nails into boards and helped piece parts together.